Cyndicate is a easy-to-use, next-generation, RSS/Atom syndication feed reader that gives you command over your news. Cyndicate will fetch, organize, and display news and articles from millions of websites and weblogs, giving you complete control over your day’s news. 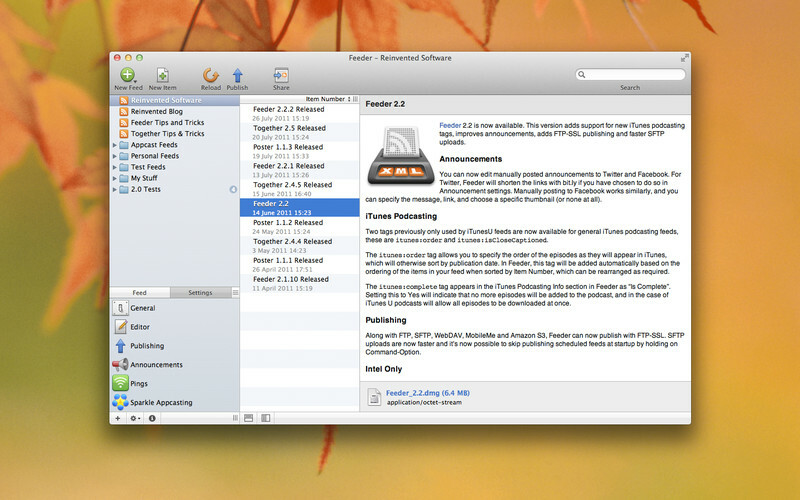 Feeder is a fully featured application for creating, editing and publishing RSS and iTunes podcast feeds. Feeder can create, download and import RSS 2.0 and iTunes podcast feeds with full support for the iTunes RSS podcasting extensions. Drag and drop enclosure files to create new items, Feeder will automatically tag audio and video files with artwork, etc in all popular podcast formats. Feeder makes editing your feed a breeze with auto-complete, templates, HTML tag insertion, previews and a customizable user interface that easily adapts to the task at hand. Feeder can publish to FTP, SFTP, FTPS MobileMe, WebDAV or Amazon S3 servers and will upload the feed, artwork and enclosure files, post to the weblog and announce new content on Twitter and Facebook with a single click. 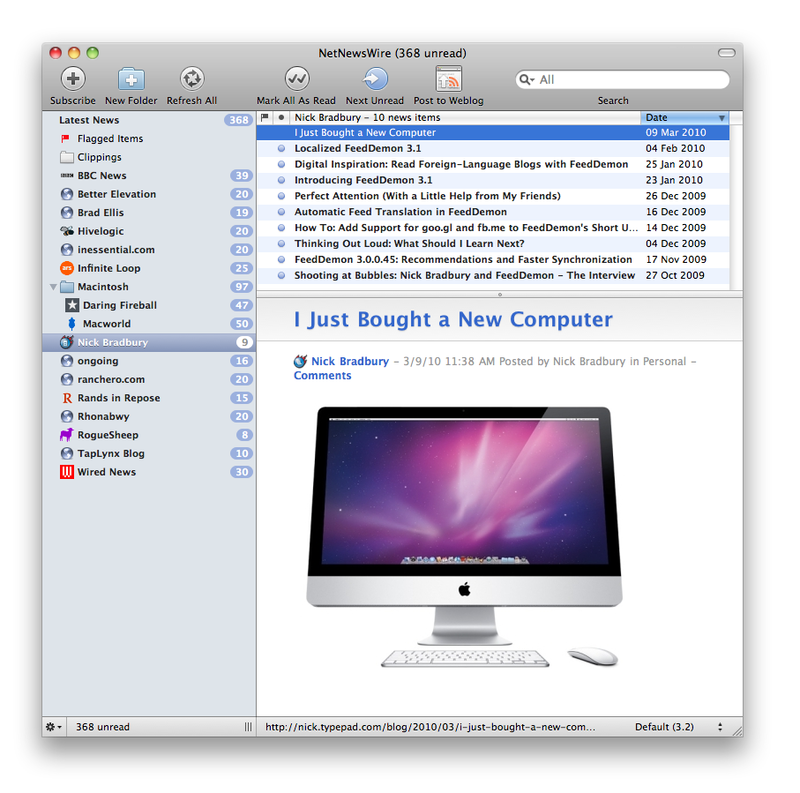 Looking for an easy-to-use RSS and Atom reader for your Mac? You’ve found it! The Eddy award-winning NetNewsWire has a familiar three-paned interface and can fetch and display news from millions of different websites and weblogs. 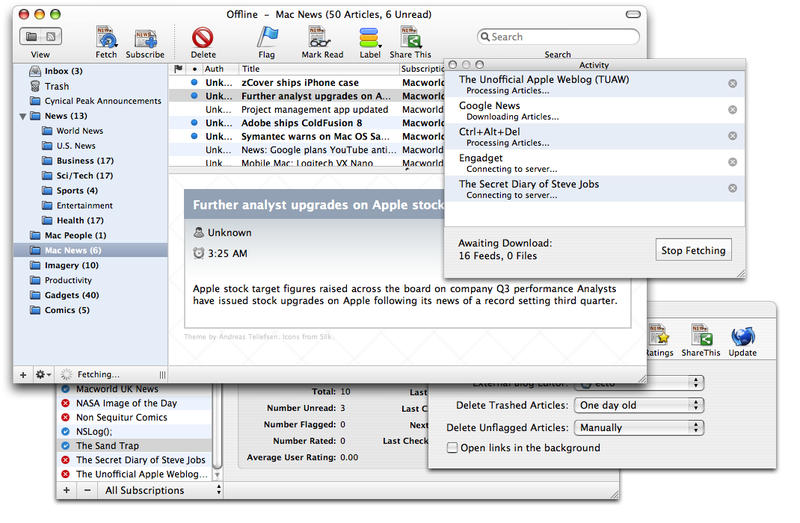 NewsRack is a powerful RSS reader for Mac OS X that can be fully synchronized with your Google Reader account (if you want to). It offers a keyboard-friendly, tabbed interface that stays out of your way, so that you can focus on the news you care about. 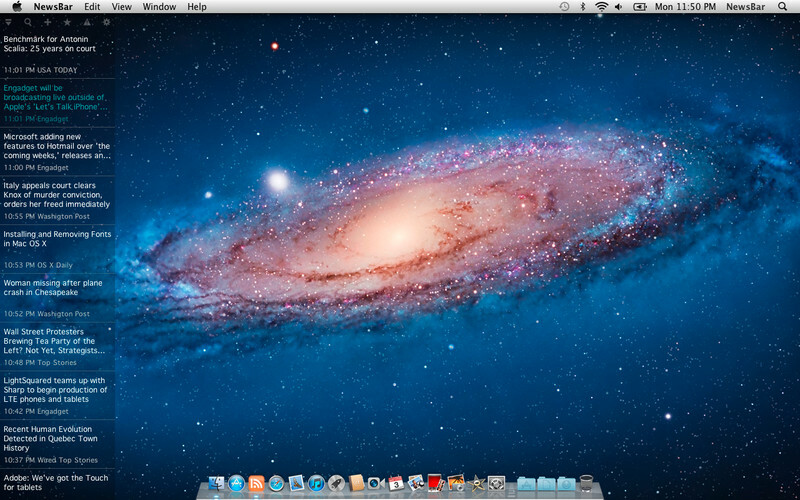 Newsbar built with a fresh concept: news feeds with smooth animation, always on your desktop. 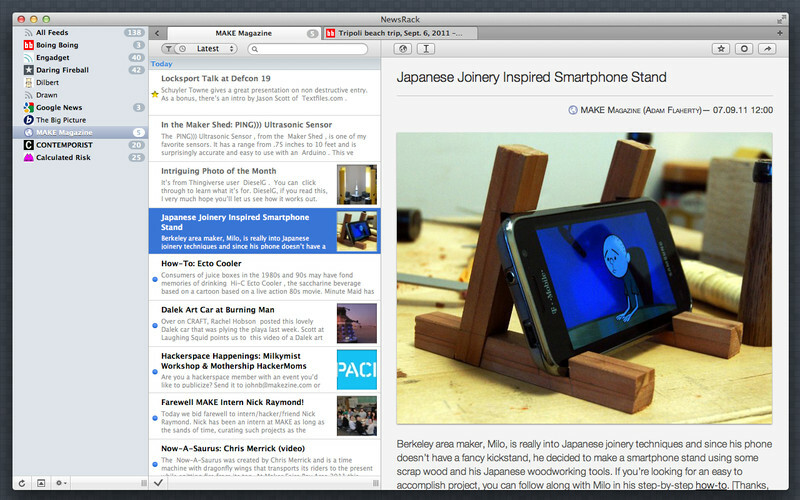 All of your subscribed RSS feeds are continuously appearing on selected side of your display or in regular window. No delays, no waiting: the news appears straight on your desktop, immediately as they published. Be the First to Know! – You can easily Read, Follow, Mark, Filter and Search news from your favorite feeds. The news are directly read from RSS sources without delay, with 1 minute lowest refresh rate.